A colleague missed an appointment with a vendor. She called the vendor to apologize. Thinking about the conversation later, she realized that she had said “I’m sorry” numerous times. She called me to ask if you can say “I’m sorry” too much. Surprisingly, I said “Yes.” Since I teach etiquette, I would never tell anyone to be rude. If you trip someone, spill coffee (or anything else) on someone, or inadvertently hurt someone’s feelings, it is appropriate to say “I’m sorry.” If you work in customer service, saying you are sorry may be part of your job description. 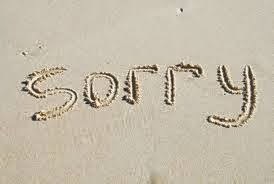 However, my friend touched on one of several areas where people (often women, but men as well) overuse “I’m sorry,” and, as a result, hurt their professional image. 4. Say “I’m sorry” when it is your fault. This occurs when you have done something that you shouldn’t have done, such as giving out the wrong information. Many of my seminar participants struggle with this issue.